Front rise: 9 1/2" ; inseam: 28 1/2" ; leg opening: 5 1/4"
These jeans sit really high on the waist. I bought a white pair by the same name and they sit lower and are more comfortable. I pulled the tags off at home before trying them on and I would have returned them otherwise. Great fit...very comfortable! I love them. They are my new favourite jeans!! I really like these, have the same ones from last season too. Great fit! 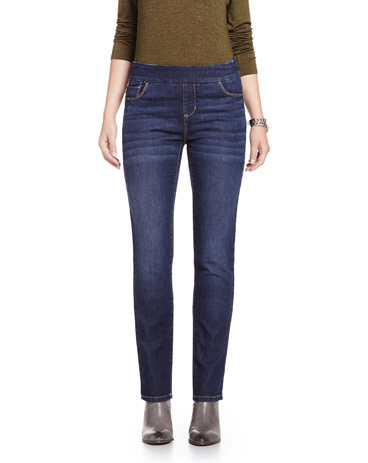 The perfect jean that can transition from work to after hours. They fit well and the material is incredibly comfortable. Love the fashionable hem.